If you wish to include cost-effective installation in your home that is easily recognisable, then you do not want to bypass the benefits of installing a laminate floor. One of the primary advantages of this flooring is its price point. Laminate flooring is about 50% less than hardwood and also cheaper than carpet. Plus, you do not have to replace it for years so this type of flooring is a good one to pick if you are trying to cut costs. Unlike a hardwood floor, carpeting, or marble, a laminate floor will not fade from the sun and is also highly resistant to scratching or staining. Because the floor is made with a layer of melamine plastic, it can withstand a lot of abuse over time. When you combine this type of layer with a tough core board, you simply cannot ask for a better budget type of floor. Adding the core board helps the floor withstand as much as 544 kilograms per square metre of pressure. Usually, installing a laminate floor is also an easy process. The floor does not require the use of a special glue because it is made with a tongue-and-groove click system. Therefore, in order to install the floor, you only need to snap it into place. Plus, you do not have to worry about the materials that comprise the subfloor. Laminates are floating floors and therefore can be installed on top of concrete, vinyl, or plywood. You can also apply the flooring over concrete slabs that are radiant heated. When you review the selection at flooring stores, you will find that laminate flooring patterns perfectly replicate the look of real wood. In fact, when you see this type of flooring on display, you may ask yourself why you would even pay for a hardwood floor? However, hardwood has its advantages too. If you are a budget-conscious shopper, though, it is hard to overlook this type of flooring upgrade. 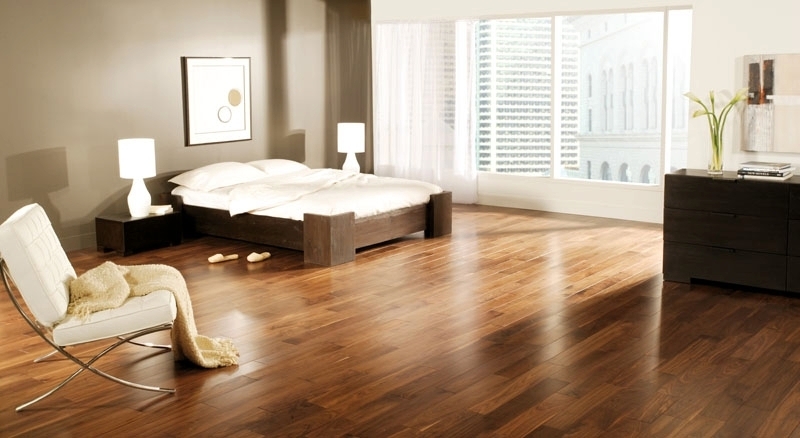 Once you install a laminate floor in a bedroom or dining room, you may wonder about its maintenance. Fortunately, cleaning is an easy task as well. You do not need to polish or wax the floor. All you need to use is a vacuum or a dry mop. You can follow up the cleaning with a damp mopping if you want. You might also consider buying a robotic vacuum. That way, cleaning will be a cinch. Affordable robotic vacuums can be scheduled to clean the floor, thereby making maintenance carefree. The core of laminate floors is made of post-industrial wood waste or ecological sustainable pine. So, by choosing this type of floor, you are also playing your role in keeping things environmentally sound. Plus, the floor provides the look of wood without the need to cut down any trees, which is another way to support the environment. If you suffer from allergies too, they will not be a problem with a laminate. That is because it does not capture the dust and dander as carpeting does. So, if you want to breathe easier from a cost and health standpoint, this is the flooring to choose.